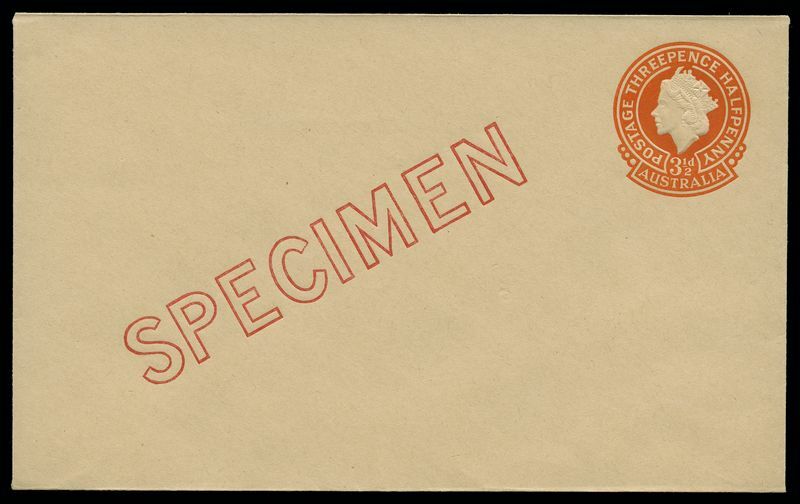 1928 1½d Red KGV PTPO Embossed window envelope with advertisement for A.W. 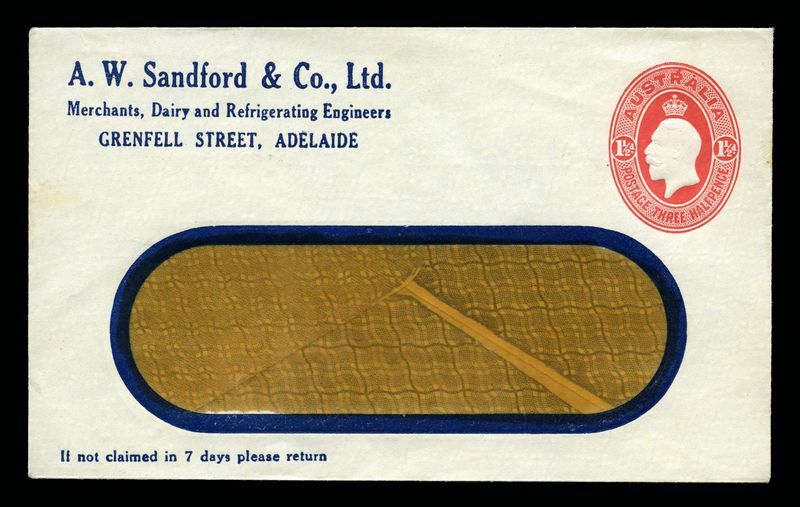 Sandford printed on reverse mint. 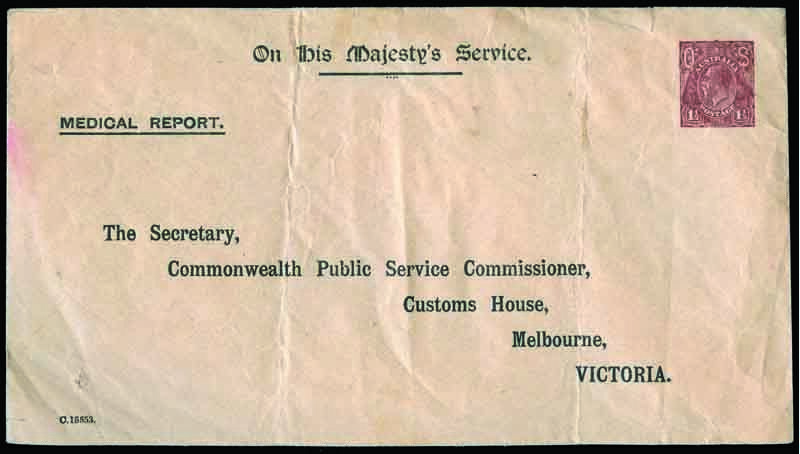 ACSC ES69. Catalogue Value $300.00. 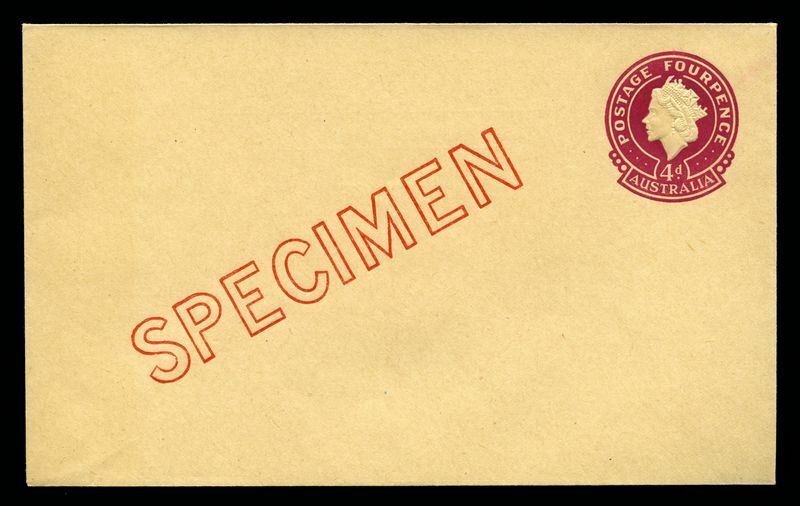 1956 3½d Orange QEII and 1956 4d Plum QEII Embossed Envelopes O/P Specimen in Red. 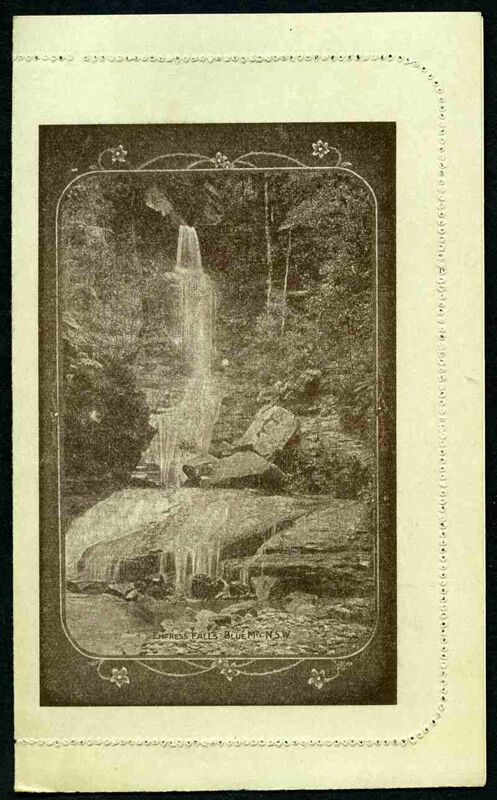 Only approximately 400 of each were overprinted for UPU distribution. 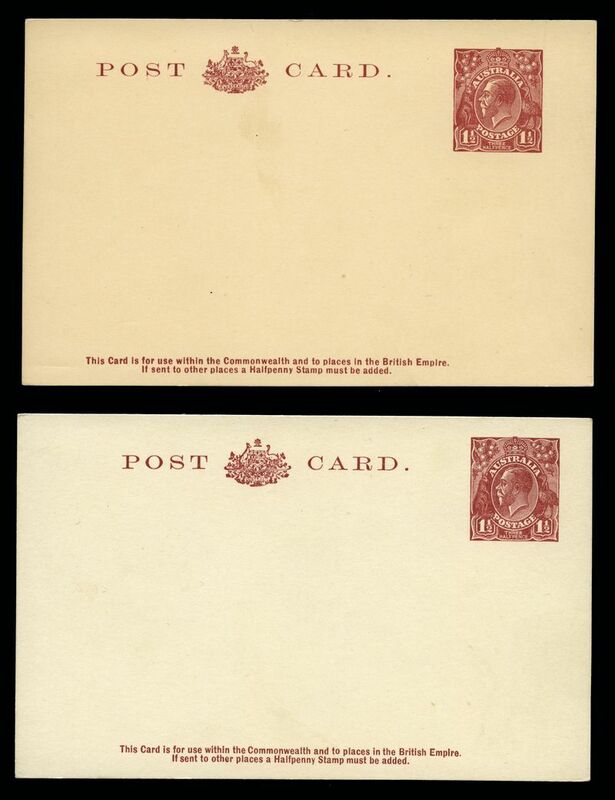 The 3½d envelope was not issued without the overprint. ACSC EP54w and EP55w. Catalogue Value $300.00. 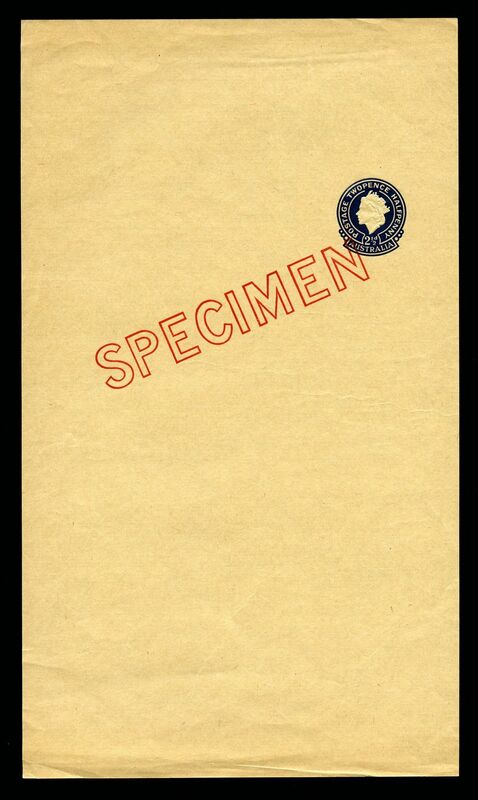 1956 4d Plum Embossed Envelope with stamp impression and embossing omitted mint. Has only the senders address on reverse. 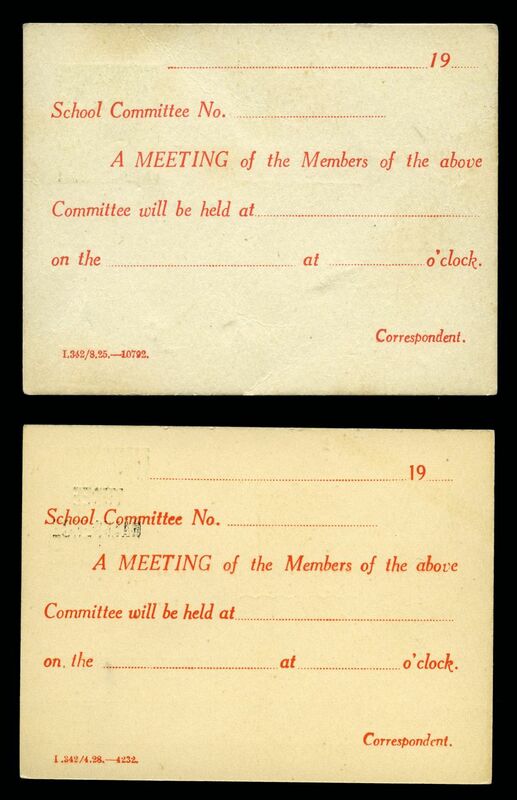 1924 1d Green Die 1 KGV and 1½d on 1d Green Die 1 KGV OHMS Postcards mint, both with printed messages on reverse regarding school committee meetings. ACSC PO6 and PO9. Catalogue Value $300.00. 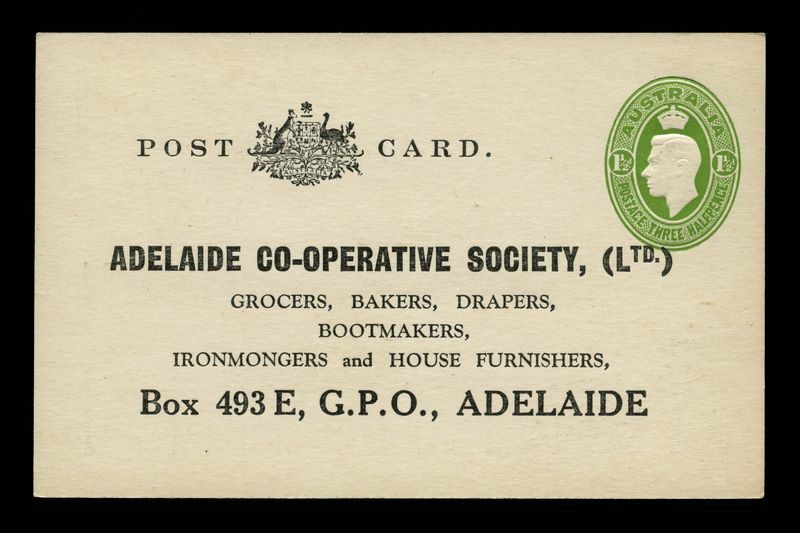 1942 1½d Green KGVI PTPO Postcard mint with printed address for the Adelaide Co-operative Society. ACSC PS29. Catalogue Value $200.00. 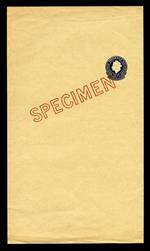 1957 4d on 3d Dark Green Die 2 QEII Postcard O/P Specimen in Red. ACSC P78w. Catalogue Value $100.00. 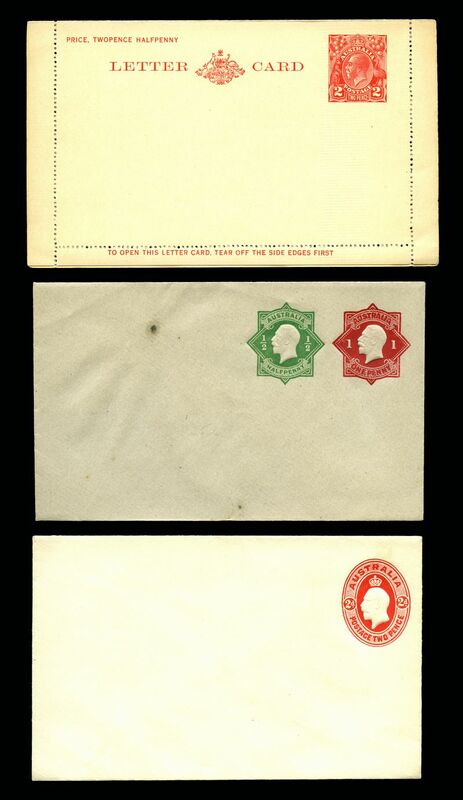 1976 Red (12), 1978 Blue (9), 1981 Brown (11), 1982 Black (8) and 1982 Natural Heritage (6) postcard packs. Several packs without plastic covers. Face Value $355.00. 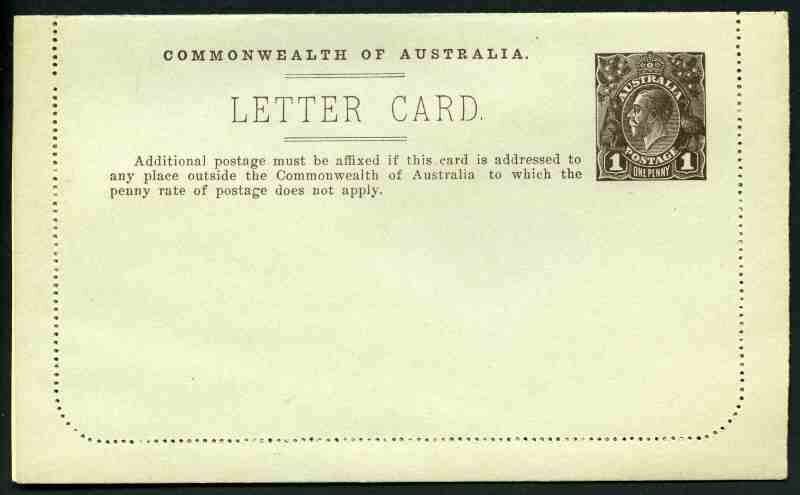 1913 4d Orange Kangaroo Small Registered Letter with instructions on reverse and no price in fine mint condition. Slight pre-printing paper flaw on face. ACSC RE3. 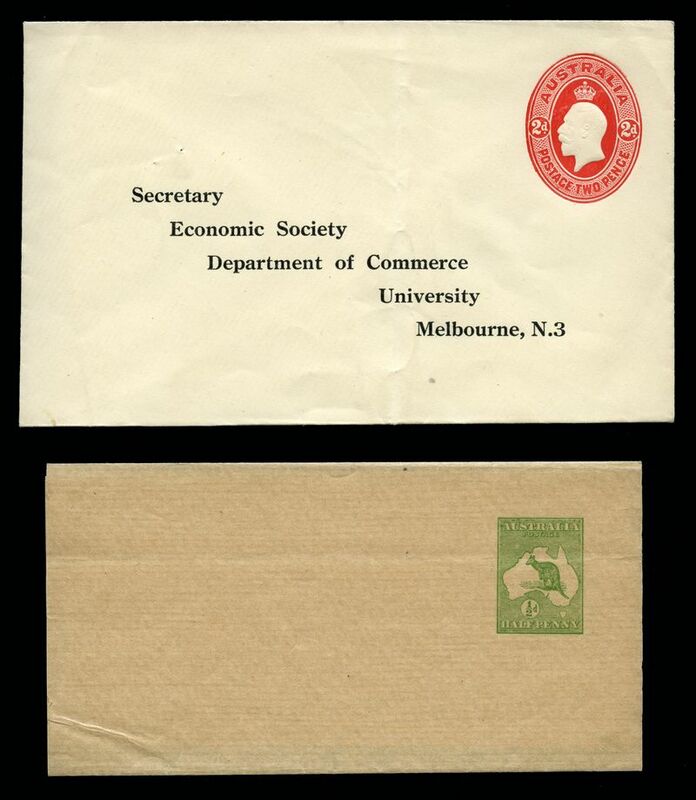 1952 10d Plane mint (14), 1954 10d Plane and Globe mint (7), 1956 10d Olympic Games cancelled FDI, 1959 10d Jet cancelled FDI (8), 1959 10d International Congress of Scientific Management cancelled with special CIOS postmark with A. Streater address label (17) and 1963 10d Royal Visit cancelled FDI with J.M. 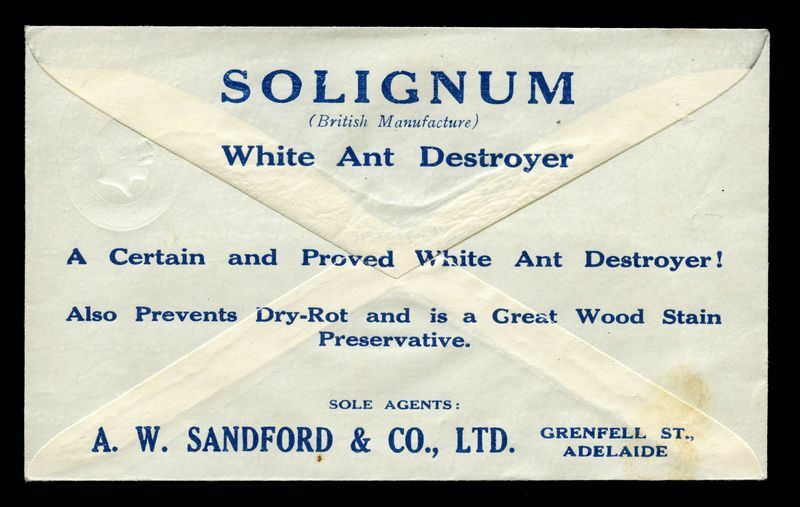 Gower address label (6) Aerogrammes. ACSC A6, A8, A9, A10, A14 and A20. 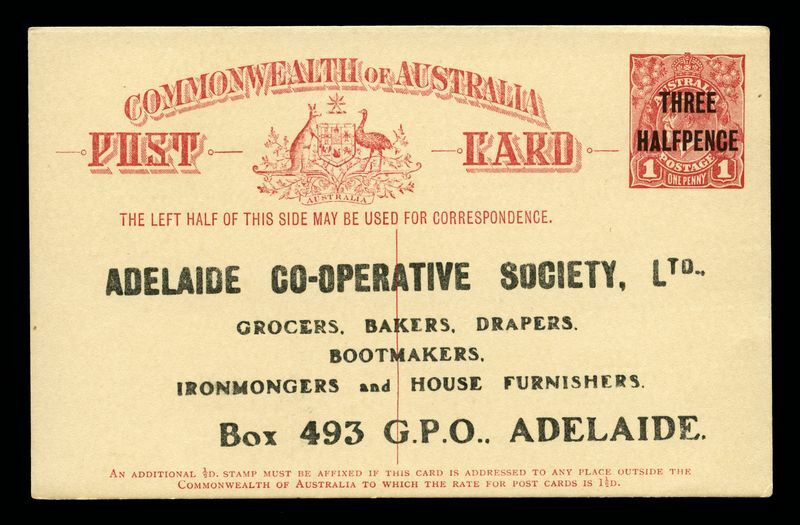 Catalogue Value $1,235.00. 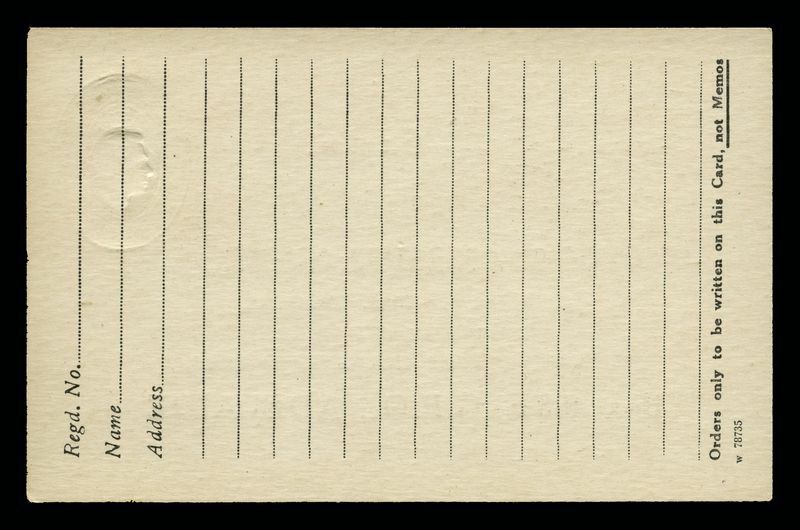 Also 1944 WWII Stampless Air Mail Letter Card with the slip-in-flap and "This flap may be gummed" on flap unused. (34). Mostly folded with odd fault or minor blemish. 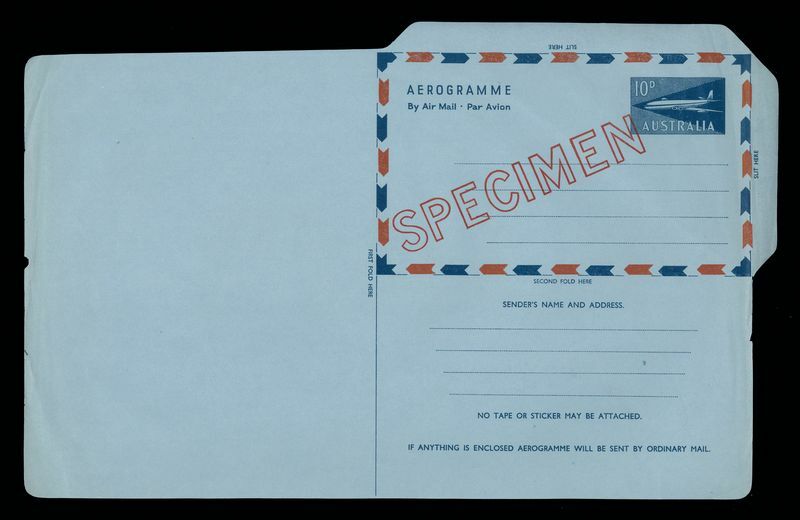 1959 10d Jet Aerogramme O/P Specimen in Red (430 printed) and 1959 2½d Dark Blue QEII Newspaper Wrapper O/P Specimen in Red (377 printed). 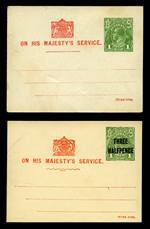 The wrapper was not issued without the overprint. Trace of light creasing. ACSC A10w and W28w. Catalogue Value $300.00. 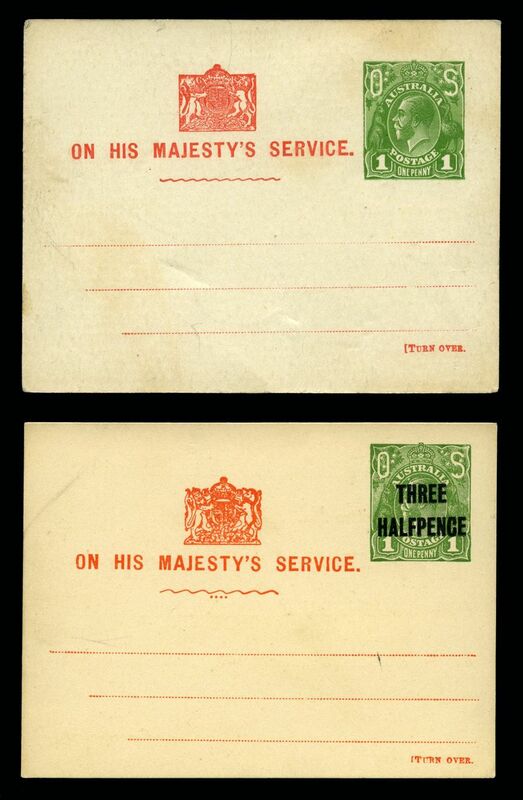 Selection of 8 mint KGV era Embossed Envelopes, Postcards, a Lettercard and a Newspaper Wrapper, 2 with printed addresses. A couple of minor blemishes, but mostly in fine condition. ACSC ES32, EP13, EP36(4), P48, P67(1) (2), LC64 and W1. Catalogue Value $555.00. 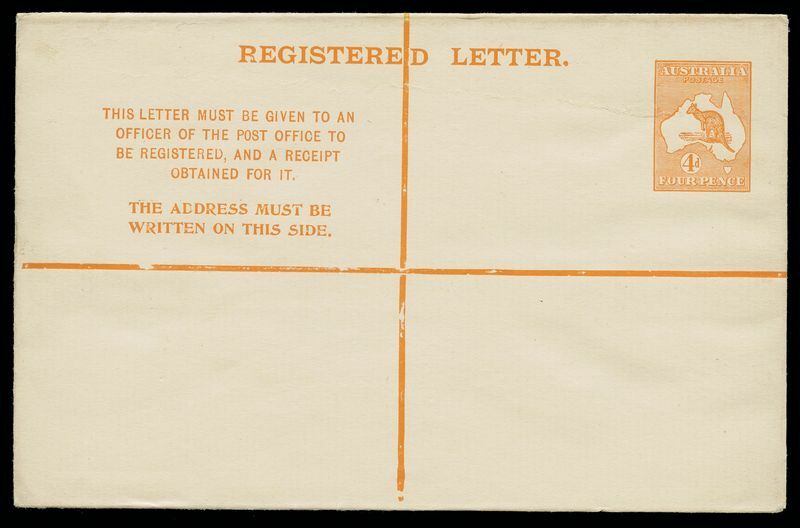 Selection of Postal Stationery items comprising 21 mint KGVI and QEII Pre-Decimal and 26 mint and 1 CTO Decimal items from 1966 to 1970 including Embossed Envelopes, Postcards, Registered Envelopes, Lettercards and a Newspaper Wrapper including useful items. 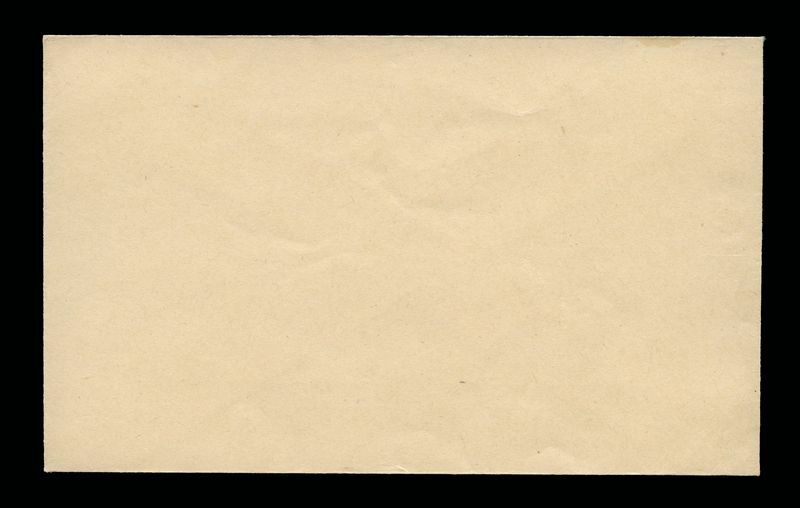 Few are duplicated and odd minor blemish.Catalogue Value $1,192.00. 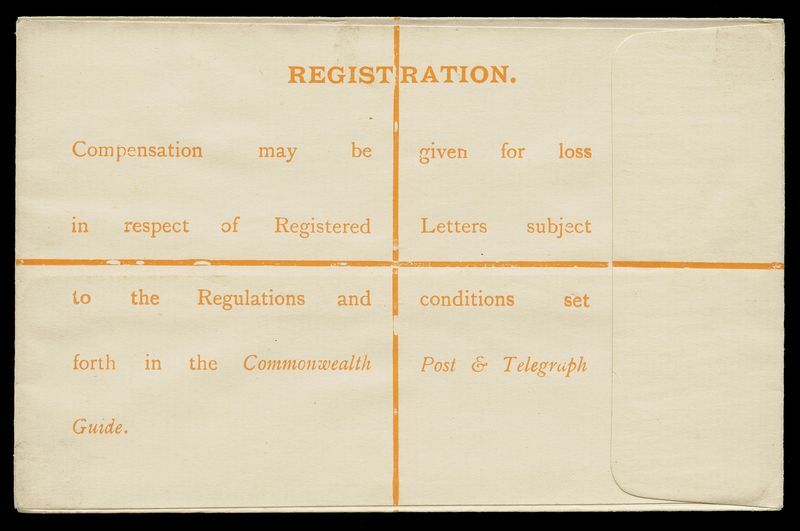 Accumulation of hundreds of mostly mint Aerogrammes, Lettercards, Lettersheets, Postcards, Registered Envelopes and Embossed Envelopes including a useful range of Pre-Decimal Aerogrammes. Numerous duplicates. 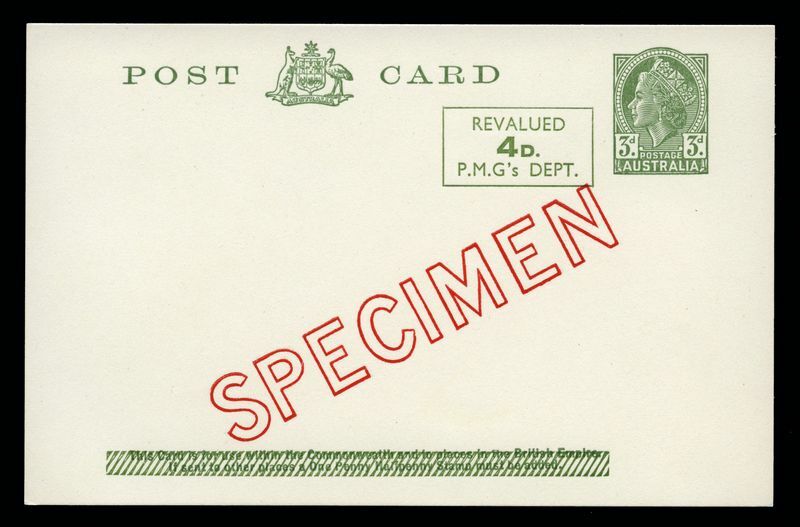 Accumulation of many hundreds of covers and Postal Stationary items from 1934 to 1995 including First Days Covers, PSE's, Souvenir covers, Lettercards, Aerogrammes and Postcards. Some handy items and Foreign content.